Rep. Devin Nunes (R., Calif.), the intelligence panel head who has spearheaded an investigation into corruption at the FBI, also warned in a speech that China has emerged as the most serious strategic threat facing the United States. Nunes said President Trump is close to declassifying new information he believes will show the FBI and Justice Department misused their counterintelligence power to spy on the Trump campaign during the 2016 election. The House committee, as part of a probe into Russian collision, uncovered corruption involving the misuse of a Democrat-funded, anti-Trump dossier produced by former British intelligence officer Christopher Steele. The panel also discovered thousands of text messages revealing the anti-Trump bias of key FBI counterintelligence investigator, Peter Strzok, who led the Hillary Clinton email probe and was part of the Russian collusion investigation. Strzok was fired by the FBI last month. He was among several FBI and Justice Department officials fired or demoted for their role in questionable spying on the Trump campaign. Among those fired was FBI Director James Comey and Deputy FBI Director Andrew McCabe. Nunes said the House intelligence committee has been conducting its investigation under a little-used oversight authority aimed at executive and judicial branch malfeasance. The select committee was created in 1977 and was granted special investigative power following the Watergate scandal of the 1970s that led to the resignation of President Richard Nixon. A rule gives the panel special authority to probe both the administration and courts when those branches of government "go awry," Nunes said. "Without the Republican colleagues voting to exercise that rule, we would have never been able to declassify what you guys all know now was the dirt that was used, generated by the Clinton campaign, fake news stories, created and used to spy on American citizens and a Trump campaign official," Nunes said. How the committee investigation will end is not known, Nunes said. "But I can promise you this: We're on the verge, I believe, of having full transparency in this process," he said. Nunes made the remarks at a dinner hosted by the Center for Security Policy, which gave its annual Keeper of the Flame award to Nunes Thursday night at the Trump International Hotel. Trump currently is reviewing the possible release of additional details redacted from four Foreign Intelligence Surveillance Act applications for warrants approved by a secret surveillance court on behalf of the FBI and Justice Department. Declassified details are expected to confirm indications the dossier was the used as the main basis behind the FBI counterspy probe of Trump campaign official Carter Page and the Trump campaign. "We knew that the dossier, the dirt, and the fake news stories made up the bulk of the FISA," Nunes said. "We thought that would be enough to finally get the mainstream news media to actually engage in this process and see that something had gone wrong," he noted. "But what did they do? They buried it. They buried it, and switched the story to say ‘Oh no, no, no, it was actually somebody else'—there were all sorts of deflections." Democrats sought to divert attention from the improper spying by producing a separate redacted committee memorandum aimed at countering the Republican members' charges. Nunes said the Democratic memo actually helped the investigation because "they put a lot in there for us to use later." Former FBI Director James Comey initially testified when asked if the dossier information made up the bulk of the Page FISA application, and said "no, it was really a mosaic" of information, Nunes said. "Well I think you all have the right to know what's left in that mosaic," he said. 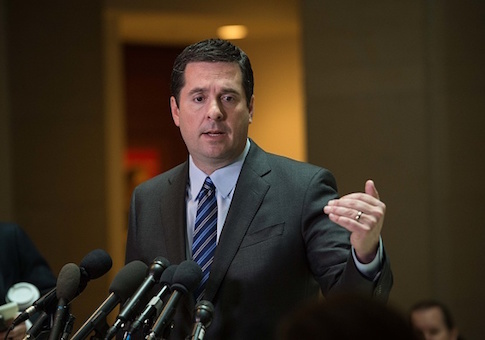 After one heavily censored FISA application was made public through the efforts of Judicial Watch and others, Nunes said Democrats and many in the press insisted "the really bad stuff about the Trump campaign was buried in the redactions." "And I said, you know what, you might be right. We should declassify the whole thing," he said. Since then, the mainstream media and Democrats have gone silent. "And you know why? Because I think they're going to be frightened by what you see," he said. "It's not just going to be economic growth and running on the economy," he said. "It's also going to be about what the other side did to play dirty, to dirty up a campaign—but not do it through campaign tactics, but do it by corrupting the FBI and the DoJ." "That is important for the American people to know and we have to deliver that message going into October." Nunes said he is very hopeful Trump will approve additional declassification in the coming weeks. "The message is really going to boil down to this: Do you all think that it's ok to start a counterintelligence investigation using our intelligence services that are designed to go out and track terrorists and other bad guys around the world, do you think it's ok to use those services to target an American political campaign?" A second question is whether "it's ok to use dirt generated by one campaign, and plant it with the FBI in order to go get a warrant on an American citizen that's involved in the other campaign?" "It's not acceptable," Nunes said. On China, Nunes said the committee has been investigating the threat from China "because we actually have a few problems in this world other than Russian interference in our elections." The mainstream media has not covered the threat posed by China because news outlets seem more interested in talking about Russia. "China is the real threat today," he said. "I'm not discounting Russia. Russia's a threat, but China is the real threat." As the United States was "sleeping," Nunes said, China managed to build up one of the world's largest militaries and is dominating the Asia-Pacific region. "They're a real force, they're a challenge directly to the United States military," he said. In addition to the military buildup, that includes cyber and space weapons as well as advanced missiles, China also is covertly expanding its power around the world through predatory economic policies, in places such as Africa. "They've gone in, built roads, built dams, spent a lot of money and caused problems for a lot of African nations to kind of control and manipulate those governments," he said. "I think what many of you don't know about is they've also done the same thing in countries that may surprise you, countries all over Central and South America, even countries in Western Europe." Since the financial crisis of 2008, China has been buying energy companies and financial institutions and invested in major infrastructure development projects all around the world. "And now you're starting to see the effects," noting China's use of its diplomatic power against Taiwan, an informal U.S. ally. Last week, the Trump administration recalled American ambassadors from Dominican Republic, El Salvador, and Panama after those states switched their diplomatic recognition from Taipei to Beijing. "So this is a threat that has to be dealt with," Nunes said. The House panel has held hearings on the China threat, including China's world wide military expansion and the Chinese threat to U.S. government and private sector research and innovation. Nunes said Trump, as a moderate Republican, is governing as one of the most conservative U.S. presidents. That has prompted Democrats and their liberal allies to attack Nunes and Trump on a regular basis, he said. "The reason that the press is completely, finally, essentially come out of their shell and became who they always were is because they don't know what to do," he said. "So they've put everything they have out on the field and this is really Nancy Pelosi's last stand," Nunes noted. "The reason that they have this fight, the reason that they have Antifa, the reason that they're protesting, the reason that they're causing all of these riots, the reason that they're doing things that you normally wouldn't see in this country, the reason that they're actually willing to corrupt the FBI and the DOJ—they're doing it because we're winning folks," he said. "We're winning and I think we have a good chance to win this fall if we keep the faith, stay on message, and help out our colleagues." This entry was posted in National Security and tagged China, Donald Trump, FBI, Russia. Bookmark the permalink.